Critical Path – How does it Work? 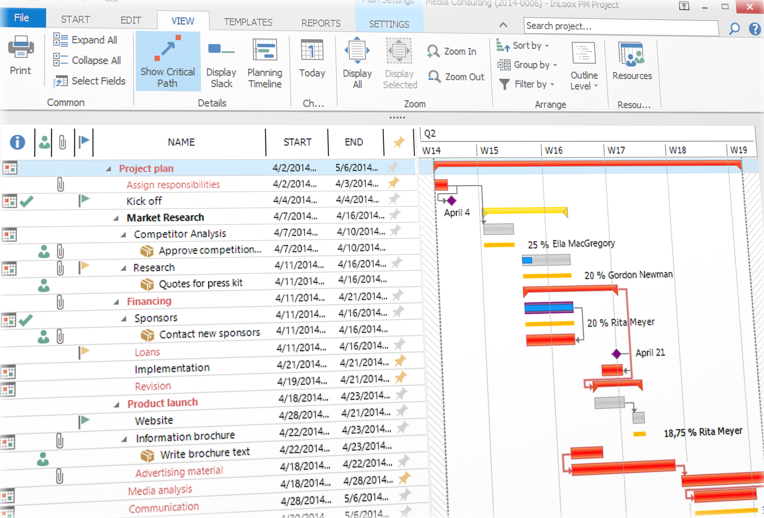 A few weeks ago we introduced the Gantt chart and the critical path as important project management techniques. For businesses the decision whether or not to implement the critical path method (CPM) can determine the success or failure of a project. The aim of this entry is to give a more in-depth insight on how CPM works . The critical path method was developed in the 1950s by Morgan R. Walker of DuPont in cooperation with James E. Kelley Jr. of Remington Rand to address the challenges of managing complex projects and processes. This method is commonly used for all kinds of projects, particularly those with interdependent activities. A critical path is a sequence of interdependent activities or tasks and it is the longest path (i.e. path with the longest duration) from project start to finish. At the same time, the longest path is the path that shows the shortest possible length of time in which the project can be completed. If there is a delay in one activity, the whole project will be delayed accordingly. Thus, it is important to identify the ‘critical’ activities that need to be finished before the project can be completed. Activities are depicted as a network of arrows that connect two event nodes in CPM. It is important that all interrelated activities are clearly outlined in order to have a functioning network of events and activities. Before the critical path method can be used, the important or ‘critical’ activities have to be identified. ‘Critical’ activities are those that cannot be delayed without delaying the duration of the whole project. These activities then need to be compiled in a list. Before a network diagram can be constructed, the dependency and sequence of activities need to be identified. It is important to identify the activities can run parallel and those that are dependent on the completion of the previous activities. Traditionally this was done with pen and paper, but nowadays this is often done with a project management software. In Inloox PM 8.0, for example, it is possible to create a critical path from a finished project plan. In a CPM diagram each activity starts with a start node or event. These nodes are connected with arrows that depict the activities that need to be done in order to finish the tasks. The duration of each activity needs to be estimated, this can be done by using past information and knowledge. In the graphic above (see 3.) the path Start-> A -> C -> B -> End is the critical path as it takes the longest time, it also represents the minimum time needed to complete the project. As all activities on the critical path have an impact on the duration of the whole project, an acceleration of the project is only possible if the total time for the activities on the critical path is reduced. As the task completion times are only estimated at the beginning it is necessary to update the diagram during the process of the project with actual completion times. Only then it is possible to see whether the project is on the right track. This might affect the structure of the existing critical path, but a new critical path can appear, too. There is a limitation to the CPM, however, in that it can be used most effectively for routine activities and if the activities are too detailed the CPM network diagram might become too complex. Regardless, in general using CPM can be critical for a project’s success (pun intended). Critical Path – How does it Work? - InLoox • Copyright 1999-2019 © InLoox, Inc. All rights reserved.